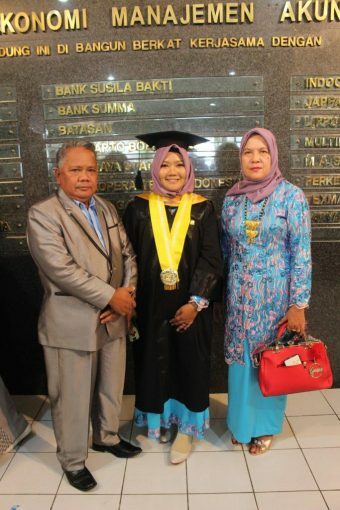 “Returning to Yogyakarta, don’t remember the family in Palu, complete all matters in Yogyakarta, and immediately return to serve.” A motivational sentence from Asriyana’s father, burning her motivation to fight back to achieve graduation. It is still remembered in the memory of the earthquake and tsunami that occurred in Palu, Central Sulawesi, on September 28, 2018, which destroyed parts of the city of Palu. One of the victims affected by the disaster was a Master of Science Program student named Asriyana. Asriyana is a Master of Science Program in Management majoring in Palu, Central Sulawesi. On Wednesday, January 23, 2019, the Masters Program in Science and Doctor of the Faculty of Economics and Business, Gadjah Mada University presented a happy moment by officially releasing 43 graduates and graduates from the BRI Auditorium, 3rd floor, FEB UGM Master of Science and Doctoral building. One of the graduates was Asriyana, who had struggled to achieve her graduation in the midst of the disaster that struck. When the disaster struck, Asriyana was domiciled in Palu because she was taking data for her thesis. Asriyana had to lose her place of residence, damaged household appliances, and missing files for completing the thesis. Asriyana’s determination to keep achieving her graduation also faded. However, the strength given by his parents made him motivated to get up quickly and complete his task. One of them is support from parents. After hearing the words from his father, Asriyana’s determination which had been extinguished to fight was back on again. Slowly but surely, with the help of his friends too, Asriyana began to get back on track. And finally able to complete the thesis even though it was hampered by the disaster faced.